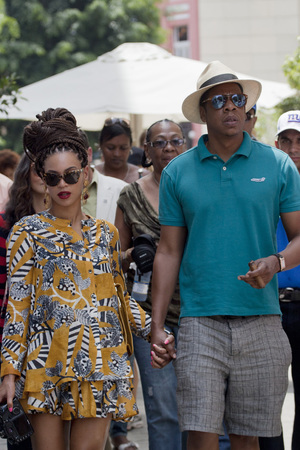 Beyoncé and Jay-Z Are In Cuba, But Where’s Blue Ivy? Beyoncé and Jay-Z have been married for five whole years now, so where better to commemorate their anniversary but… Cuba? The couple took their mothers with them to Havana this week, where they went out to lavish meals, posed for pictures with the locals and wore a bizarre array of animal print clothing and accessories. fans. 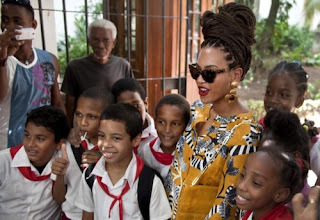 Beyonce posed for pictures with local schoolchildren while Jay-Z puffed on a Cuban cigar, and then they popped into another restaurant that boasts a rooftop terrace with a sweeping view of the harbor. Beyoncé and Jay-Z declined to speak to reporters, and it was not clear why they traveled to Cuba. 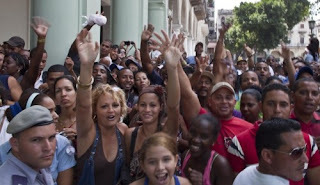 State-run website CubaSi called it a tourist trip. Washington’s 51-year embargo makes it illegal for US citizens to visit Cuba for mere tourism, although tens of thousands of Americans travel here each year on academic, religious, journalistic or cultural exchange licenses. In the past, artists who were challenged by the government have said they visited for cultural purposes. So, what were they doing in Cuba? (Maybe Beyoncé was spreading the message of modern feminism!) And the real question is, where’s Blue Ivy?